This took 56 hours to complete. Not the best of photos and there is a gap near the knee that hadn't been completed in this photo but you get the idea. How much?! wow sooo cool! Thanks...this was kind of a stretch for me I am glad you like it. Tattoo is great but not for this lady, I think. Wow, nice. The tatto is very riveting, anyway. :] But in my opinion she has a little bit too ugly legs for it. 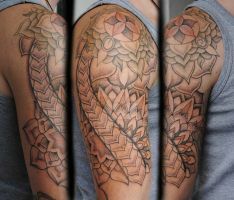 A little question: you're making this tattos on your own account or using some patterns from f.ex. tattoo catalogues? I take reference material wherever I find it. I freehand it when I have to, copy when I need to. Whatever. I am only interested in getting the best finished result I can. I keep coming back to look at this, just so beautiful, great detail, one of the best tattoos I have seen. I am glad you like it that much. I had a lot of fun working on this one. Had to order so many shades of blue from so many different companies that it was out of control at one point. I´d never wear a tattoo like that, but I must say this one is really well done! It´s very detailed, the clothes texture, the fish, the water... It´s perfect! As I said I wouldn´t wear it but I love to see it! just... RESPECT!!!! wonderful design, color, shadows, position, everything! wait wait, how do tattoos like this one take 56 hours to complete? like i get the fact that they are big and such but do you do half of it themn leave to heal then come back and finish? whats the process? I typically work anywhere between two and four hours per session. Taking up this much space, 56 hours is actually quite fast as I move a little more efficiently than most tattooists. That stuff you see on tv where they do half a full back in a session is not "reality". The reality is that large projects are much more commitments than "events". You have to return until it is complete. AND you typically don't know how many hours something like this will take when you first start it out. It was one of my favorites to make happen. Thanks alot. Thanks I am really happy to hear that someone appreciates this art. Thanks ... I had fun doing it.